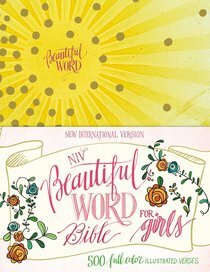 About "NIV Beautiful Word Bible For Girls Sunburst (Black Letter Edition)"
Discover God's Word through gorgeous illustrated verses. Crafted on high-quality paper and balanced with inspiring full-color art and blank space for journaling, the NIV Beautiful Word Bible for Girls encourages girls to spend quiet time with God and his Word. This Bible contains 500 illustrated verses to illuminate the rich stories, characters and hope contained within Scripture. It inspires girls to explore new ways to grow their faith, drawing deeper into God's life-changing Word.